Hope Studios: Master Bedroom Wrap Up, Complete with Art! 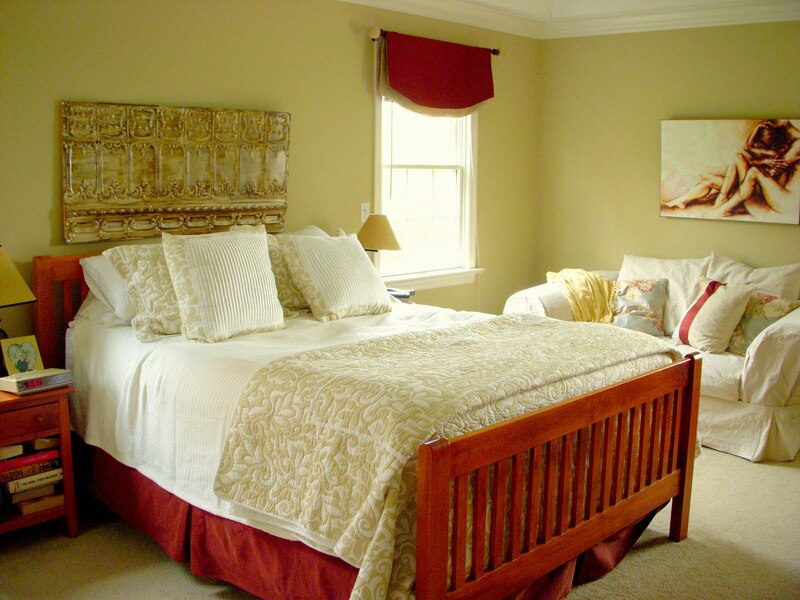 Master Bedroom Wrap Up, Complete with Art! Okay, it's time for the complete reveal along with some tips for recreating the artwork I made for my Master Bedroom Spruce Up. I'm sure most of you figured out from my Junking Post that I chose the old tin ceiling tile (complete with bird poo) for my bedroom art. I purchased it at the building salvage store for $13 and hauled it home in my girlfriend's truck. I took it outside and scrubbed it, then propped it up in my room and The Big Guy took one look at it and nearly fainted. He told me to get it OUT of the room, he was NOT sleeping under that thing! Geesh. And then my camera battery died...oops. Anyhoo, I moved onto my next step anyway, which I will describe now. Sorry. Using a foam brush, I brushed on Folk Art Antiquing Polish in brown in 1 foot sections and simply wiped it off with a clean rag. I used a light hand with the wiping part to be sure lots of gunk stayed in the nooks and crannies. I then used small finishing nails to attach the two short ends to a 1x2 strip of wood on each side to which I attached picture wire. Then I hung it on an ordinary picture hanger on the wall (it's very lightweight). And here is my new room! Guess what? No one has become diseased or died sleeping under my new junk turned treasure artwork either. Ha! I love the crisp look of the white and tans, I love the new artwork, and I have sat on my slip covered love seat every day! Ah...sanctuary...all under $200. wow, that really makes the room!! awesome! Too funny that your husband said no way about sleeping under it! I love then what you did to it, it still looks old, so great job! That is awesome! All the detail really shows up...you could not have picked a better home for that piece. Beautiful and I love the total new look of your room...well done! Wow!!!! I love it!!!! I found some of that tile also....I really want to put in up on my kitchen ceiling!!!! hope you had a super great mothers day!!!!! wow! you really saw a treasure in that tin that I didn't initially see! you go girl! Love it! Weird how boys can't see past the bird poo. Ya' know? it looks so GREAT!!!! LOVE that tin! I'd love to find some too! Wow you go girl! It totally rocks. You did a fantastic job. You showed hubby didn't you. What a wonderful idea! You did a great job - and have a lovely retreat to show for it! It's so fresh and summery too! It all looks FANTASTIC! Great work!! Huh, I'm feeling so inspired now!! So glad you won in the decorating! They really have no idea! ☺ Looks GREAT! Rock on girl this is Awsoem!! Fabulicious!!! And only $13.00? I am so jealous. 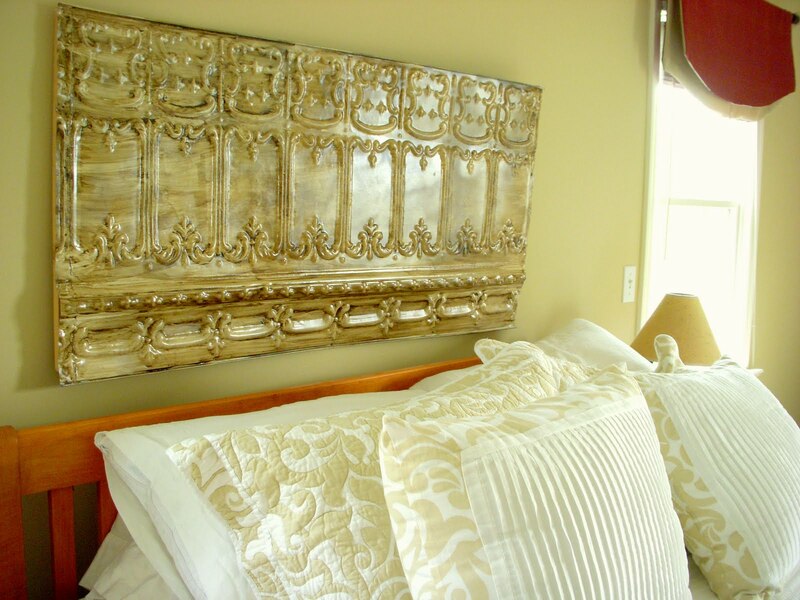 What a great new headboard idea! Love how it all turned out! Under $200? WOW! I'm really impressed. I love the distressed tin ... you did a wonderful job. I wish my husband were more willing to "go with it" sometimes, too. :) Way to go for figuring out a way to make everyone happy! Although there really is nothing sexier than bird poo.